Luis Suarez is controversy personified, he’s probably the most hated person in football and as a Liverpool fan it’s impossible to defend him if we actually wanted to. This World Cup he was fine, missed the first game and came back to the second game by scoring the two winning goals. The third game, however, he did something that will hopefully ban him from the rest of the World Cup. The things he does, he continues to do no matter how many bans he gets. The only way to stop this from happening is to make sure he never steps on a football pitch again. He could have been such a respectable footballer as he has a lot of ability, but his other actions let him down. Here’s our top 10 Luis Suarez moments! The ball is coming in to the penalty area, he shoulder barges Parker forwards and then realises he can’t get the ball. So what’s the logical thing to do? Kick him in the chest, obviously. He actually acted well in this but the point I can see is that he clearly knows he dives and loses his temper. It’s quite bad that he’s actually using what is considered unprofessional in the footballing world to make more money. Last season, Suarez revealed how if his club Liverpool didn’t get Champions League football he would leave. Arsenal actually triggered Suarez’s release clause and it looked certain that he would go. Liverpool convinced him to stay somehow, although it may have something to do with th new contract that would make him the second highest paid footballer in the Premier League. There were also other things in there like a higher release clause. It’s clear Suarez’s loyalty belongs to the highest bidder and if it weren’t for him being one of the best footballers in the world, Liverpool probably would have got rid of him ages ago. Great build up play to get him into the box, a nice turn to give him some space, then he just flops on the floor. Sometimes his dives can earn free-kicks or penalties (not like I’m happy about that) but most of the time you just laugh because they’re that bad, this one being one of the worst of the bunch. If a dog bit someone it would be put down, Suarez bites someone and he gets a temporary ban from a sport. I wonder what makes him do it, it’s not like he was aggravated or annoyed to the point to actually sink his teeth into someone else. My favourite dive of all time, you have to love how a tap to the back is someone a gunshot to the head to him. I really don’t understand the motive. He wasn’t even near the ball, yet he took a chunk out of his arm. He says he just “lost control” but with the many thousands of footballers out there and only him stupid enough to bite someone in a place with so many cameras that you’ll never get away with it is retarded. Finally, something good about him. Say what you want about him being a disgrace, but you can’t deny he’s a terrific footballer. These 4 goals show that. Although it’s against Norwich who aren’t exactly Barcelona, every goal was something that most strikers only pull off once a year (besides the second goal). It’s all over the news at the moment. The player who has the best chances of carrying their country far into the World Cup will earn himself a lengthy ban for biting someone, in a game with millions of people watching. Again, no motives, no intelligence and proof that he won’t stop doing it, so why give him the chance? A very controversial topic and one that has two sides. 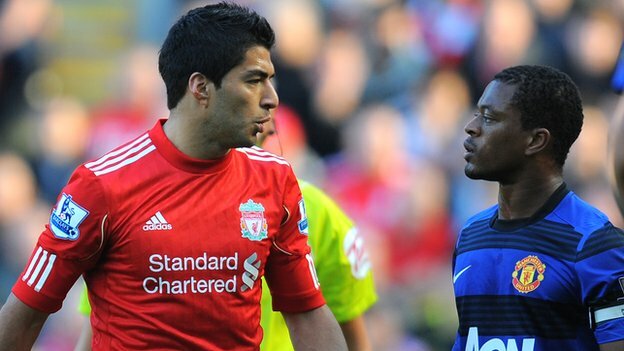 After a spat on the pitch, these two developed a large hatred for eachother, Evra saying Suarez racially abused him, Suarez denying it. Evra would then go on to do things like celebrate in front of him after a win and from there it just got worse. A pre-match handshake was rejected by one of the two, Suarez did skip Evra but if you watch it, Evra isn’t too eager to get the handshake either. I think it’s just immature and both of them were in the wrong, just shake hands like men and put it in the past. But now Suarez has added “racist” to the long list of insults towards him. So there we are. Described as a cheat, diver, racist, cannibal, rat and so many other things, Suarez is certainly a disgrace. As a Liverpool fan, I’d want Liverpool to sell him and buy a young, high potential player to partner Daniel Sturridge. He’s put a huge dent in the respect of Liverpool Football Club and will soon have his country against him too.